A month or so ago I solicited the advice of my readers on the selection of a device for reading e-publications. I learned that the Kindle - my original choice - would not meet all of my needs, but I received some strong endorsements for the Apple iPad. As someone who pays full price for SIM-free mobile phones just so as not to be tied to one provider, the idea of a device that only let you use what Apple approves and insists on being tethered to iTunes did not, unfortunately, appeal to me. My online activities are very Google-centric, I'm a fan of open source and I already have an Android smartphone so inevitably my thoughts turned to Android tablets. 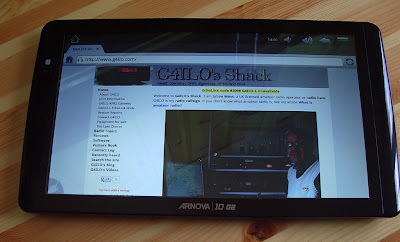 Someone mentioned that Maplin had some cheap tablet computers in their sale - the Archos Arnova 10 G2. Maplin is rarely the cheapest source of anything even in a sale so I visited a price comparison site and found that Carphone Warehouse had the Arnova for £10 cheaper and with free shipping. I checked some reviews and the majority were very positive, even though many qualified their comments with "for the price." The tablet was in my hands 24 hours and £139 later. As a tablet virgin my impressions probably aren't worth much but even I can tell that the Archos is not Apple build quality. The plastic case is more reminiscent of something that came out of a Christmas cracker. £11 on eBay got me a leatherette case/stand for the tablet so I don't see the case anyway. But as many reviewers said, it's a lot of tablet for the money. I haven't got around to trying any e-book readers yet but I've used it for email and web surfing and I love it already. Battery life is great, the tablet is silent as there is no fan inside and no Intel Pentium giving you a hot lap so it's a much better laptop device than a laptop. One problem was that there was no Gmail app as I use on my smartphone. The Arnova doesn't come with the standard Android Market so the choice of apps is rather limited. I found some instructions for installing Android Market on the Arnova but as usual whenever I attempt something technical with computers I got error messages that aren't mentioned in the description. After trying a few things at random and on the point of giving up I noticed that Gmail had been installed and I had the full Market, except that it has been renamed Google Play. That probably confused me into thinking it was something to do with games, which I have no interest in. The one thing I haven't managed to do yet is find an app for my blogging activities. On the PC I use Blogger Dashboard in a browser (Firefox, of course) but on Android Dashboard is no good for keeping up with the blogs I follow because the list of posts is in an iframe and the Android browser doesn't support scrolling in an iframe. Nor does the Dolphin browser, which I was led to believe would be the solution. I'll probably have to use gReader, as I do on the smartphone, but I'd hoped the tablet would let me use something a bit more sophisticated. We watched a TV show on the Arnova using the BBC iPlayer and I was impressed by the quality. Until then I could never understand why anyone would want to watch TV on a computer but in fact the angular size of the Arnova screen in my lap is larger than that of the TV when I'm sitting in my armchair, so it's actually better. As you may gather, I'm pleased with my new gadget! I don't consider non-apple to be narrow-mindedness, but open-mindedness. I've been told by folks familiar with APRSISCE/32 and Apples application approval standards that I'd never get it approved by them because "it does too much". Apple only want simple things with simple user interfaces for simple-minded folks. If you're happy with having your decisions constrained by a third-party that has their own interests at heart (rather than your ability to choose), then Apple's the platform for you. But I'm thankful we live in a free world where we (most of us, anyway) have the freedom to decide and to choose what is best for US, not best for the manufacturer. As because we're free to make those choice, all of you Apple-fans are free to ignore my ramblings as well. Glad you've got a tablet - As you are finding, it will do a lot more than a Kindle. I smiled when I read the comment from the anonymous poster about you missing out on the finest tablet... While I'd never ever go as far as calling you narrow minded (!) the fact you had to bugger about to get the Android Market installed, and are facing limitations with the browser etc do show that Android is great for tinkerers and experimenters, but not perfect by any means for people that just want something to work 100%, every time. Regarding Lynn (D)'s comments re: Apple = Simple-minded folks... I take offence. There are some absolutely fantastic applications on the iPad/iPhone/Mac that are fully functional and incredibly detailed. Please don't mistake a great and simple user interfaces for dumb and simple applications. Yes, Apple can be a pain, but if you write the software to their standards (which many people successfully do), you shouldn't have a problem. I'm not quite sure why Windows vs Mac vs Linux / Windows Mobile vs iOS vs Android seems to polarise people so effectively, but as a user of all of the above operating systems, the one I go to most often is iOS as it's as close to an appliance as I've found, with access to some really rich applications with beautiful UI. iOS lets me forget about the operating system, and concentrate on the application or content. Anyway... Hope you're feeling well Julian - My thoughts are always with you and your wife. I love my Samsung Galaxy Tab 10.1. Expensive, but good quality. I was fortunate to receive mine for "free" when I signed up for my TV/Phone/Internet service bundle. I also chuckled at the Apple "fanboy" post. Different strokes for different folks. I use a small android netbook. App market doesn't really work for me so I download apps from a pc and put them on a sd card then transfer them to the android using an installer app. Works for me. I was broad minded enough to purchased a Motorola Xoom WiFi only Android tablet at the end of June last year. I have never regretted buying it and have used it everyday since. I can recommend installing Dolphin for PAD to browse the web, File Manager HD by Rhythm Software to manage your files and Mantano Reader for you ebooks. Glad you are enjoying your tablet. You might want to look at Google Reader for reading blogs - I don't know if there's a nice tool for writing them though. Well, indeed not using Apple seems much more open minded than have to use it. Apple is close to itself. Next door is open to some troubles but would give more results. Inside apple if you have have any solution you MUST stay within it or leave it. Or make something from scratch by yourself quite for yourself only. No way to put some bricks not already made for this together. BTW as I need a "small" WI#tel platform for contest logging, easy transport and forgiving hardware ... I am seriously thinking to get a mac-mini and fly with it. Not a wizz-bang machine at all. But, it have the smallest foot print, it's self contained and it's easy to move around ... just the newest of those wouldn't not be able to use two inexpensive monitor ... well, mini ITX cost almost the same, with some more power but also it's more power hungry ... older mac-mini on ebay, ummhh. Several solutions may come on target. Always hope to read from you Julian, BTW here 50 MHz have opened several times to ZS, who knows ... CU. As I'm sure most folks realise, it's perfectly possible to use an iPad and run whatever software you want. I refer, of course, to the process of jail-breaking. As Lynn (KJ4ERJ) has reminded us, we live in a free world (for the most part). I am very happy with my iPad 2, and even happier with the ability to considerably enhance its capabilities thanks to the easy jail breaking utilities that are around today.